Katie McGrath. . Wallpaper and background images in the Katie McGrath club tagged: katie mcgrath morgana. 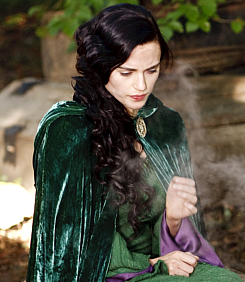 This Katie McGrath photo contains mantel, oper mantel, oper haube, opernmantel, and opernhaube. There might also be capote, kapuzenmantel, kapuzen umhang, surcoat, and wappenrock. You're very welcome to spread our graphics but please do ask before and always credit accordingly. Thank you!